Deckchairs and donkeys, Punch & Judy and The Pier, those were the essentials of the British seaside holiday for several decades. Starting in Victorian times as health resorts for the rich the seaside towns had, by the nineteen thirties, become the annual playground for the working man and his family. The piers, originally built for elegant promenading whilst imbibing ozone, gradually acquired entertainment ranging from the mildly naughty "What the Butler Saw" peep show machines to the Brass Band Concert and the end of the pier Pierrot Show. And of course there was Punch and Judy. 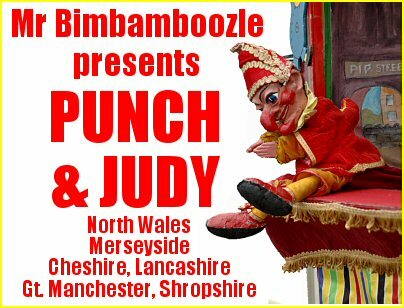 Right from Victorian times Punch & Judy has been associated with the seaside resorts. In some cases the show was performed on the pier itself, although more frequently the performer found the best pitch to be at the pier entrance. 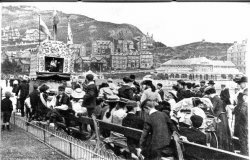 One of the earliest of these was the Codman show at the entrance to Llandudno's pier. The Codman association with Llandudno started in the eighteen sixties and spanning four generations continues to this day. There is still a Codman Punch and Judy Show performing at the entrance to Llandudno's pier. Rhos on Sea lost it's pier long before it lost its Punch and Judy. This was presented by another member of the famous Codman family. Bert Codman had two pitches, one in Rhos on Sea and the other at the entrance to Colwyn Bay's Victoria Pier. Nearby Rhyl had a Punch and Judy presented on the pier before and after the Second World War. It then moved onto the promenade, perhaps in anticipation of the demolition of the Rhyl pier in the nineteen seventies. This show continued on the promenade until Professor Green's death in the mid eighties. There were also Greens associated with Punch and Judy on the Blackpool piers. Probably Britain's greatest Punch and Judy performer was Percy Press. He performed in many places throughout a long career, but he is remembered for his two main pitches, at London's Madam Tussauds during the Winter months, and on the pier at Hastings during the Summer. With the gradual decline of the traditional British seaside holiday the Punch & Judy man has found it harder and harder to make a living from a seaside pitch and has had to seek more lucrative venues. There are probably no more than a dozen resorts left with a resident Punch show on the beach, promenade or pier. Fortunately there has been no decline in the popularity of the Punch show. In fact there are more Punch performers now than there have ever been - but they are more likely to be found at a child's birthday party, at a village fete, in a shopping precinct or supermarket foyer than they are to be seen at the end of the pier. Chris Somerville (Mr Bimbamboozle) talks authoritively and entertainingly to schools about The Seaside and the Punch & Judy Show in support of KS1 projects.